Sunday School is from 9:15-10:15 in the lower level. (Go down the stairs behind the worship center, and you’re there!) You can also enter through the lower level doors that face the playground. 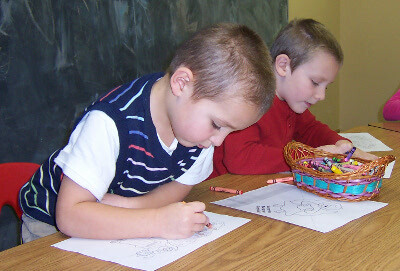 Preschool-6th grade use FaithWeavers curriculum. This means that they will all be discussing the same Bible story, will be sent home with parent handouts & will be provided with different ways they can weave faith into their daily life. 1st-6th grade have a Sunday School opening with music & skits once a month. Please drop off & pick up your child at their classroom every Sunday. If you are new, we welcome you at any time in the year! Grab a registration form from our Children’s Ministry Board or a Sunday School teacher. We welcome infants and toddlers in worship, and consider the noises and challenges they bring blessings to our ministry. We also offer a staffed nursery during the 9:15 and 10:30 services for children ages 0-3. The nursery is located in the back of the gathering area, next to the bathrooms. You are welcome to stay with your child, or drop your child off with our trained and caring volunteers. All volunteers that are older than 18 have passed a background check. You will be provided with a pager that will vibrate during the service in case you are needed. One of the best weeks of the year! Every summer, Good Shepherd has a free Vacation Bible School, open to all, Preschool-5th grade. VBS includes Bible stories, music, snacks, games, and a great time. Registration is open now! Register here! We know raising kids to have a faith in Jesus Christ can be intimidating. Click here to download our Faith Marks book– a collection of practical ideas on ways to help you and a child in your life grow in faith together. This book is also available here at church. If you have questions, or would like one mailed to you, please contact Cori. During a Childrens Ministry event (Such as Sunday morning, VBS, etc.) you can look for volunteers wearing a blue lanyard with a name tag. Feel free to ask them anything!